If you have always dreamt being the King of the Swingers in Jungle Book of Rudyard Kipling – then there is a golden chance to live the dream by being the King of Spinners in the slot Jungle Jackpots. The Jungle Book written by Rudyard Kipling was the most genuine friend of any child. The most captivating thing for children was the Mowgli’s jungle adventure during their childhood. 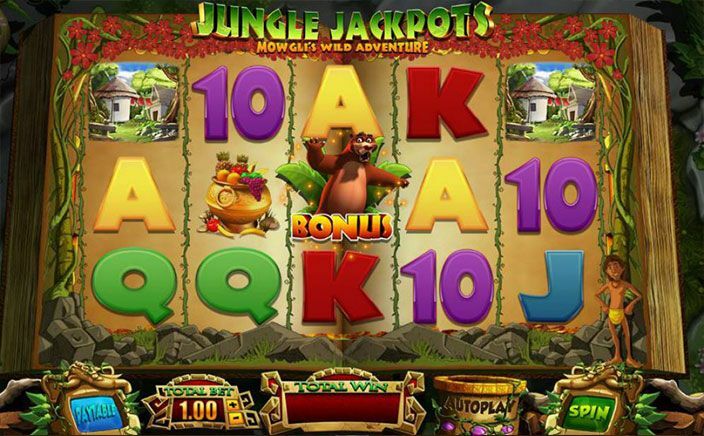 Jungle Jackpots slots game is developed and designed by Blueprint Gaming. The game developer is the UK based leading game studio. Exciting slot games are created for the online global market. Blueprint produces online slot games with licenses from Movie and big TV franchises. The slots is a 5 reels and 20 paylines game – the minimum stake limit is 20p per spin to a maximum of £500 a spin. With an adventurous theme of the jungle, the slot game is based on Mowgli which is the central character of the stories of Jungle Book. The slot is colourful, exciting and has the graphics of cartoon style with 4 bonus modes to get profit from. Mowgli Wilds: Across the reels, Mowgli swings changing random positions into wilds. Kaa Locking Wilds: Any Kaa wild icon locks in that position where you then choose 1 from three baskets to gain a spin, end or extra wilds when the reels stop. Hathi Expanding Wilds: Hathi- the elephant treads on the screen converting up to 4 reels into wild. Monkey mischief: when the reels stop, monkeys wander on the reels and pull them up to disclose stacked symbols. Check out for vultures also as they bring in the new addition of the symbols to the reels to offer you a winning combo. 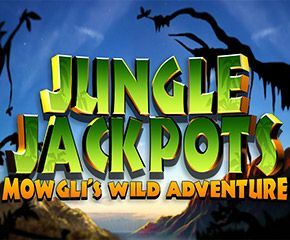 In Jungle Jackpots slots, there are 4 major bonus modes such as Mowgli’s Cash Trail Bonus, Baloo’s Cash Bonus, Bagheera’s Free Spins and Baloo’s Colossal Spins feature. Jungle Jackpots slots is among the most famous online slot machine games designed by Blueprint Gaming. For sure, you will be reminded of your childhood while playing this slot game. And the great bumper prizes and graphics will keep you engaged in the slot.